Russian President hails cooperation between U.S. and Russia, says he's ready to extend START treaty. Russian President Vladimir Putin on Monday hailed the cooperation between the U.S. and Russia particularly between the two countries’ militaries and special agencies against terrorism. “We also discussed the Iranian nuclear program. We discussed what we can do to improve the situation with North Korea. I've pointed out, and I will point out again, that I think that President Trump contributed a lot, that he did a lot to settle this issue. But in order to achieve complete denuclearization of the peninsula it will take international guarantees, and Russia stands ready to make its contribution to the extent that will be necessary. So, we can say that there are several issues of crucial importance for us -- this and some others -- we are starting to achieve some understanding which gives us sufficient ground to say that some things -- a lot of things changed to the better during today’s meeting,” he added. The meeting with Trump, continued Putin, was a “good start” in the efforts to “address common differences” between the two countries. Asked about the alleged Russian interference in the U.S. elections in 2016, which he has denied in the past, Putin replied, “People are talking about the purported interference of Russia with the election process in the United States. I mentioned this in 2016, and I want to say it now again -- and I really wish for your American listeners to listen to what I say. First of all, Russia, as a state, has never interfered with the internal affairs of the United States, let alone its elections. “Interference with the domestic affairs of the United States -- do you really believe that someone acting from the Russian territory could have influenced the United States and influenced the choice of millions of Americans? This is utterly ridiculous,” he continued. “Why wouldn't Special Counsel Mueller send us an official request within the framework of this agreement? Our investigators will be acting in accordance with this treaty. They will question each individual that the American partners are suspecting of something. Why not a single request was filed? Nobody sent us a single formal letter, a formal request,” he continued. Regarding Russia’s involvement in Syria, Wallace asked Putin about figures brought forward by independent monitors saying that since the civil war began in 2011, more than a half a million people have been killed, and Russia has bombed civilians in Aleppo and Ghouta. 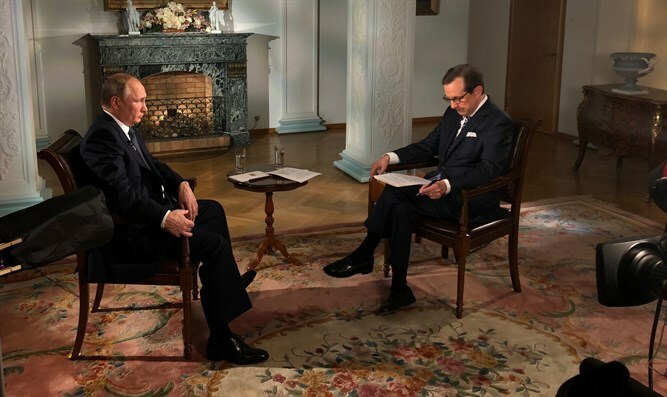 Wallace asked the Russian leader if he had any qualm about killing innocents.